Jennie is an American designer. During childhood he trained as a classical violinist, studying with several recognized characters in that area. Later she directed her professional career to the field of corporate law, after several years as a lawyer and with the birth of her twins, she was reborn in her passion for creativity and that is when she decided to return to the artistic field with the creation of Jennie Kwon Designs. Audrey Hepburn was the stage name of Audrey Katleen Ruston. Actress, model, dancer and activist born in Belgium in 1929. She is considered the greatest female legend in the history of American cinema, but more importantly, she was also known for her humanitarian work at Unicef, she collaborated with communities in need as Africa, South America and Asia between 1988 and 1992 and awarded the Presidential Medal of Freedom in recognition of her work as Ambassador of the Goodwill of UNICEF in 1992, a few months later, at the age of 63, dies from colon cancer, in Switzerland. Despite of the ostentatiousness of the phrase, she always stays far of the world of fashion. Her images was natural elegance, non-ostentation of jewelry, or costumes. The love for the pearls of the emblematic haute couture designer and creator of the house Chanel is well known. She was one of the most important dressmakers in history during World War II, she was a pioneer in the trend of an informal, simple and comfortable clothing style, very different from the one that the society was accustomed to, this brought many controversies around her, not only for that, also for having contributed to the Nazi Secret Police (Gestapo), during the German occupation in France, which made her competitors use this information to give her a bad name, however, after that difficult time, she managed to claim the position of her brand until she die in 1971, her fame remains until our days. It seems to be a law of nature. Indeed it is, if you look at the latest developments in cosmology there’s a law that is imposed on the rest: ”The universe is not perfect” Maybe it is out of subject, but I will do it. It’s good to be a blog, and not a magazine. Gravity is a perfect universe creating a perfect stability, and when there’s only imperfections the universe starts moving. Fascinating, right? Salvador Dalí, this memorable Spaniard, painter, sculptor, set designer, maximum representative of surrealism, had the opportunity to work with great and renowned characters such as Alfred Hitchcock, Walt Disney and Luis Buñuel. He was characterized by a great imagination and by his remarkable tendency to narcissism whose objective was to attract the attention of the public and generate controversies around him, he took his creativity also to the field of jewelry. Mouths made with rubies and pearls, watches that lose their consistency, among other pieces. Some of the most significant have been reproduced as costume jewelery with excellent design by the Gala – Dalí Foundation. Warren Buffett has created his own empire to become one of the richest people in the world (the third according to the Forbes list). And he is considered one of the biggest investors in the world. He is also famous for donating a large part of his fortune to charity, and for his simple lifestyle. For example, he lives in the same house where he lived before creating his great fortune. They say that much success can be attributed to inactivity. Most investors do not resist the temptation to buy and sell constantly, but the cornerstone should be lethargy, bordering on laziness. 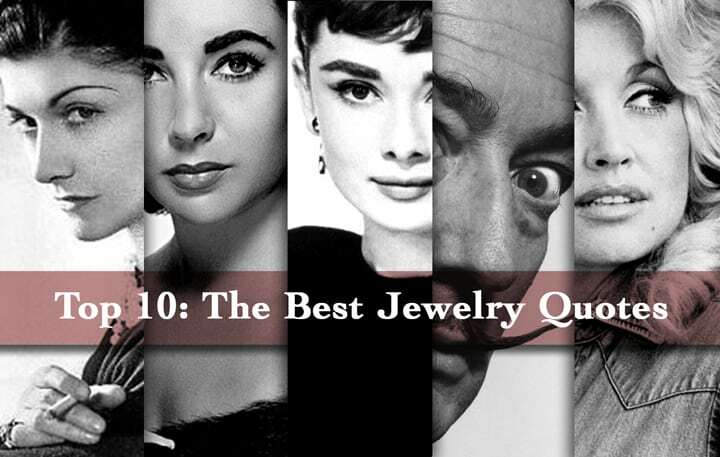 Elizabeth Taylor had one of the most impressive collections of jewelry. Many of them have been auctioned recently acquiring prices of more than one million euros per piece. And a total of more than 120 million euros. It has been valued not only the quality of the piece, but the history of each piece. No item remained to be sold. Taylor has one of the most emblematic phrases: “You can’t cry on diamond’s shoulder, and diamond’s don’t keep you warm at night, but they are sure fun, when the sun shines“. The last quote corresponds to the famous American singer Dolly Parton. The beautiful singer sparked some controversy for her usual and intensive plastic surgeries. Along with Beyoncé is the most nominated singer to the Grammy. She has a brilliant sense of humor, and warm at the same time. She knows how to appreciate the best of everyone, and take with some humor the criticals. For example, calling Dolly the first cloned sheep in the United States. All these phrases have been conceived under quite singular lifestyles and personalities, none of these characters was immortalized due to their great eloquence. Of all these phrases, what has been your favorite? Do you have any other that you want to share or that you would add to the list? I’d love to read your opinion about it, thanks in advance for sharing your comment. And if you liked the post, please share it and subscribe to our newsletter to receive more free posts. When you create art jewelry you can’t be too simple in order to be innovative.